White gold is an alloy made up of pure gold and another metal, usually nickel, manganese or palladium. The other metal used depends on what the item is being used for, as they give the alloy different properties. In general, most white gold contains about 90 percent pure gold. A lot of white gold is subsequently plated with another white metal called rhodium which makes the white gold easier to polish. The addition of the white metal and the rhodium takes away the yellowish color of the gold, giving it a white appearance. White gold is extremely gentle on the skin and is considered safe for those in need of a hypoallergenic metal. For most people, white gold will not cause skin irritations or cause skin to turn green—a more typical reaction from silver. However, since white gold is an alloyed metal (combination of more than one metal) it is important to be aware of the other used since they might have different effects. Just as white gold can contain different levels of gold, it can also contain different metals. Most white golds actually contain a mix of gold, silver, and copper. However, some white golds contain nickel. White golds with nickel are generally stronger and harder than other types of white old, but approximately 12.5% of the population has allergic reactions to the nickel based white gold alloys. Non-nickel white gold alloys are found to be less allergenic. One reason that white gold is valued is that it does not oxidize in air or moisture. This means that gold jewelry retains its shine without needing to be sealed away or cleaned regularly. White gold won’t tarnish over time and may only need an occasional light cleaning to restore it to its original brightness and appearance. Silver is considered a precious metal, but usually prices at less than gold. Silver is a basic element although it is rarely found in its pure form. Usually, silver jewelry will be sterling silver. This means that the metal piece contains 92.5% silver and around 7.5 percent of other metals like copper. Sterling Silver tarnishes easily due to the copper content which tends to oxidize. Silver is relatively hypoallergenic. This means it is safe for those with easily irritated skin or metal allergies. Sterling Silver is best, however, since some less pure forms of silver can cause mild irritations or leave green marks on a person’s skin. Silver is difficult to care for. It should be stored in a low moisture environment. If possible, silica gel should be used to keep moisture out of the air. Silver should also be stored in airtight containers or wrapped in plastic bags or plastic wrap to help keep silver from tarnishing. Silver that has tarnished can be cleaned with a jewelry polish that has been formulated for silver. 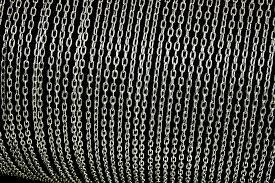 Silver chains or other intricate items may be difficult to polish at home may require professional cleaning from a jeweler. How a precious metal is alloyed will impact the hardness of the metal. Technically, metals are measured on the Vicker’s scale, which tests the plasticity of metal against an indenter. Absolute hardness can be measured using the MOH’s scale of hardness, the same scale used for gemstones. At the bottom of the scale is talc being a 1, and at the top diamond which measures a 10. Metals fall in between. Without any alloy on the MOH’s scale, gold and silver are at 2.5, copper is 3, nickel 4, platinum 4.5 and rhodium is 6. Even small amounts of alloy can drastically change the nature of a metal so sheer hardness is not the only thing to consider in the purchase of a piece of jewelry. The biggest difference between jewelry in silver and white gold in considering a piece of jewelry is price. Silver is much cheaper when compared to white gold. So, if budget is a concern, silver can be great option. If you’re looking for longevity with your jewelry, white gold is definitely going to outshine silver. It is also easier to maintain white gold jewelry when compared to silver especially when considering starting an Add-A-Pearl necklace, a gift that’s meant to last forever!